Living a Fit and Full Life: Check Out What's in My Picnic Basket for National Picnic Day (April 23rd)! Check Out What's in My Picnic Basket for National Picnic Day (April 23rd)! Spring has sprung, and that means it's time to get outside and take advantage of the sunshine! With National Picnic Day coming up on April 23rd, you'll have the perfect excuse to grab a blanket and basket for an outdoor celebration. Here's a few healthy snacks that are in our picnic basket! Flavored Water: Stay hydrated! Fun for kids and smart for parents, AquaBall's naturally flavored water is the only zero-sugar, zero-calorie, zero-preservative children's beverage around. 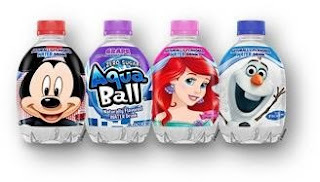 Available in four flavors, Berry Frost, Fruit Punch, Grape, and Strawberry Lemonade, and features fan favorite characters from Disney's Frozen, Disney Princesses, Marvel's Avengers, and Disney Classic Characters, the bottle alone will bring a smile to any kid's face. Click HERE to find a store near you that sells AquaBall! Click HERE to learn more about AquaBall! Follow AquaBall on social media! 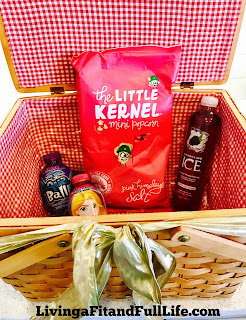 Popcorn: The Little Kernel, the newest popcorn brand on the market, is the perfect addition to any picnic! Not only is this a delicious treat perfect for everyone to enjoy, but also a better-for-you snack that has a unique, hulless, "miniature kernel." Popped in 100% pure olive oil, each popcorn is gluten-free, non-GMO, dairy-free, kosher and certified whole grains. Click HERE to find a store near you that sells The Little Kernel! Click HERE to learn more about The Little Kernel! Follow The Little Kernel on social media! Click HERE to find a store near you that sells Sparkling Ice! Click HERE to learn more about Sparkling Ice!